When English pop/rock band Terraplane fell apart in 1989, Thunder, like a phoenix, rose from any ashes that were left over. Guitarist Luke Morley and singer Danny Bowes, who were also the main song writers were retained, as was Gary (Harry) James on drums. Ben Matthews was added as a second guitarist and keyboard player. Mark ‘Snake’ Luckhurst was recruited as bassist before Mikael Hoglund was drafted in, but when the latter was not available to record their fourth album “Laughing on Judgment Day” in 1996, Chris Childs came onboard and the classic Thunder line-up emerged. From this point there seemed to be no stopping the band. They were enormously popular in the United Kingdom and had a cult following in Japan. Breaking out into the rest of the world seemed beyond them however, which was surprising considering that if the band’s sound could be compared to anyone, it would be Bad Company. Despite every album charting in the United Kingdom and after several hit singles plus sold out tours, when their ninth album “Bang” (1999.) made no impression abroad the band decided enough was enough and split up after one more sold out farewell tour. And here the story becomes one of comebacks, farewell tours and retirements. In 2002 they were enticed back out of retirement to give it one more go. Making well received appearances at large festivals for the next few years they also toured and released four more albums, all of which charted in the United Kingdom, but again made doodle elsewhere. So in 2009 retirement was announced again and another farewell tour commenced, climaxing with a batch of sold out concerts at the Hammersmith Odeon in London. Things went quiet for a couple of years, with individual members of the band doing solo projects etc. That was until offers that proved too tempting to turn down were made for the band to reform and once more Thunder rolled back across the British Isles. Their first gig was on the bill of London’s prestigious High Voltage Festival where the reception was so great it was impossible for the acts above them to follow. 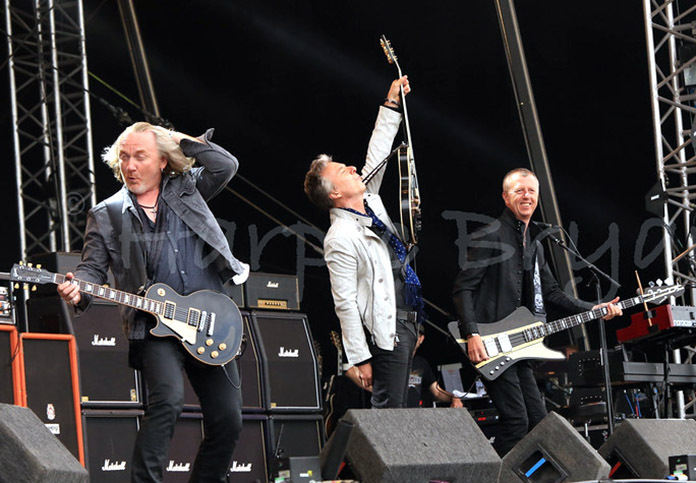 Over the next few years tours were taken in conjunction with other major headlining bands and since then they have been a going concern, handpicking which tours to undetake. 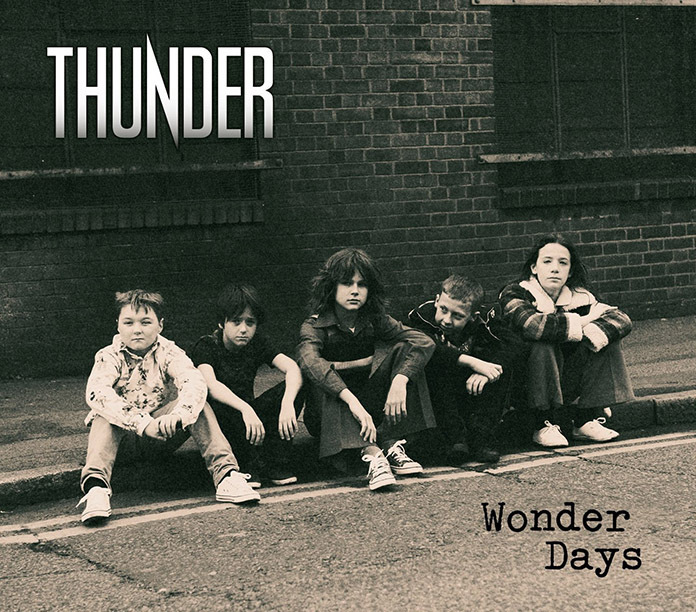 In 2014, Thunder fans across Britain got the news they wanted – a new Thunder album titled “Wonder Days”, and after a break of seven years it was as good as anything they had ever previously produced, going straight into the U.K. charts at number nine. Opening with the rocking title track, you get Luke Morley’s monstrous opening riff before the band join in, all setting up the platform for Danny Bowes to make his entrance, starting with the lines ‘’First day of school, they called me a disgrace – Didn’t like my long hair – Didn’t like my Face.’’ This punchy song is followed by the Stratocaster fantastic “The Thing I Want” where the whole band hit that Thunder groove. The songs follow on in a similar rhythmic fashion with the occasional moment to draw breathe in between; time to marvel at the axe interplay between the two guitarists. 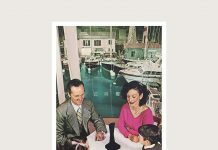 “When the Music Played” is probably the standout Thunder track on the album and the disc ends on a right rave-up of Chuck Berry meets Thunder on “I Love The Weekend”. Indeed I do! As an additional bonus to this album you get an extra CD of Thunder’s complete live set from the Wacken Festival in 2013. Next articleDoes your life have a pattern?